In the very near future the Internet has given birth to a sentient, artificial being. "Webmind" could be seen as a post-human event that could benefit the whole of humanity but some of the World's governments don't share that optimism and see this new digital life as an enemy of mankind, fearing that which they don't understand. I love how this series is so closely linked with current technology, set in the now and describing today's technology that many people use on a daily basis. From Twitter and Facebook to Iphones and Blackberry's the only real science fiction element is that of Webmind himself and this manages to ground the story, making it easy to relate to and all the more powerful. Much of the story concerns the internet, from its physical topology and the switches or routers that allow this modern marvel to perform; to the protocols and users of the great web of mankind. Having a career that puts me in touch with the internet constantly (as well as being a qualified network engineer) I really related to this book but it doesn't descend into the realms of techno-babble so much that it can't be enjoyed by the less technically minded either. The way the author manages to grasp the complexity of today's tech and describe it for the layperson is a seriously good achievement but even more so he makes it sound really interesting too. Characterisation is another strong point to the novel, the ease and grace that constitutes Sawyers writing really does allow the characters to live and breath and allows the reader to really bond with the characters. These characters continue to grow and develop as the series progresses too and the voyage of discovery that Catlin follows is superb. I loved the optimistic feeling of the novel, when so many books out there are predicting doom and gloom it's great to see that there is an alternative, that perhaps mankind isn't destined to destroy itself. There are many themes running through the novel, as with Watch the idea of what constitutes "life" is explored in more detail which merges with that of artificial intelligence and emerging consciousness while the themes of morality, ethics, personal privacy and autism continue to play a part. The nature of the internet and our increasing reliance with our online lives is of course explored too, to great effect. The story itself is fantastic, simply inspired and impossible to resist with an energetic pace and a very rewarding ending. 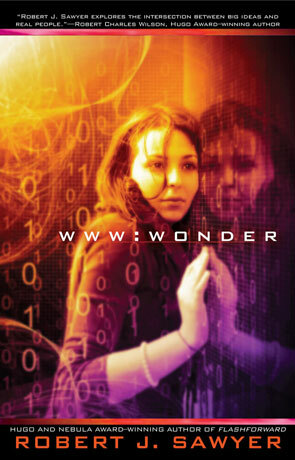 Wonder is a fitting end to a wonder-full series, novel with a unique style and confident voice that is uniquely Sawyer, highly recommended. Written on 21st May 2012 by Ant.